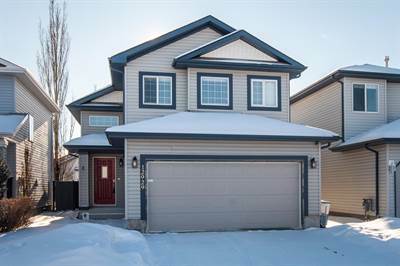 • 1285 sqft , 3 bath , 4 bdrm single story – FOR SALE CAD396,500 . Open, warm and welcoming is the only way to describe this bi-level home. Featuring 2+2 bedrooms, 3 bathrooms, double garage, and a gorgeous deck professionally designed to continue the flow of the house. In typical bi-level fashion, you enter the home and can walk 6 stairs up to the open concept living space or 6 stairs down. The main floor kitchen features loads of counter space, a must-have pantry, dining area and a huge living room. Tucked away to the side is the main bath and 2nd bedroom and up a few stairs is a large master bedroom over the garage with walk-in closet and ensuite bath. The fully finished basement is a warm and inviting space featuring large windows in the family room, 2 additional rooms with windows large enough for egress. The yard has been fully landscaped to be your own private oasis with steps leading down to a gravelled, fenced in dog run! Located in the desirable neighbourhood of Oxford, this house is the home you’ve been waiting for. Check it out today!